For thousands of years, stargazers have seen shapes in the night sky. Some of these visions, like the mythological creatures of the zodiac, are said even today to guide the course of human destiny. While the predictions of astrology may be dubious, star patterns can still be our guides. These figures help us navigate our way across the night sky and locate celestial objects. Star patterns such as the hunter Orion and the winged horse Pegasus are commonly called constellations. But the term constellation in modern astronomy actually refers to a particular region of the sky, like a country on a map. The star figures first noticed in antiquity lie within these regions. A Ladle? Or A Bear? Some constellations hold other identifiable shapes formed by stars, called asterisms. 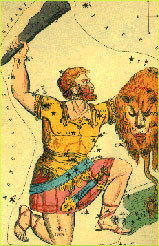 Seven bright stars within the constellation Ursa Major form what may be the most renowned asterism through the ages. This shape has been noted by poets from Homer to Tennyson, and known variously as the Plough, the Wain, and the Wagon. Today, we call it the Big Dipper. By connecting stars in the constellation Ursa Major in a different way, you can see the rough shape of a bear. Ursa Major means "Great Bear" in Latin, but many civilizations have given this asterism their own name for bear. It was "Arktos" to the ancient Greeks. (The word "arctic" today relates to the connection between these circumpolar stars and northern latitudes.) And some Native American tribes saw three hunters in nearby stars chasing the bear around the northern sky. The shapes we draw may vary, but the borders of the constellations are fixed. In 1930, astronomers divided the sky into 88 constellations, giving each a Latin name. Before this time, there was no one universally accepted sky map, and quite a lot of confusion. To see some of the constellations that are home to newly discovered solar systems, go to Find the Planets. Ursa Major images courtesy Sky and Telescope Magazine.